The Floral Blush Elite is hand-crafted from the finest copper and brass, and finished using colorful enamel glaze is painted on the urn, then fired until smooth and glossy. 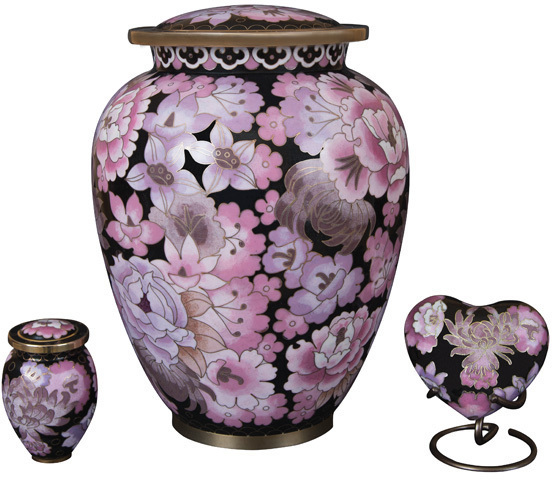 The end result is a colorful and unique sturdy cremation urn that will last generations. Due to this urn being hand-crafted, each urn is unique and may vary slightly from one urn to another. The urn is secured with a threaded lid. Heart stand sold separately. 2.5" x 3.1" x 1.4"